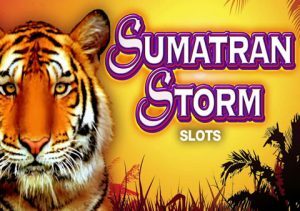 Head to the jungles of Indonesia in Sumatran Storm, a 5 reel, 720 ways to win video slot powered by IGT. Just like stablemate Siberian Storm, tigers take centre stage in Sumatran Storm. Also like the original, there are plenty of free spins in offer in this Asian adventure. Play from between 60p and £600 per spin. Sumatran Storm is played using the Multiway Xtra game engine – the reels have a 3x4x5x4x3 set up which offers 720 ways to win. Successful combinations are created when the same symbol lands on adjacent reels. The more that land in a reel, the bigger the potential wins. Winning combinations can start right to left as well as left to right. Visually, Sumatran Storm is a pretty simple affair and has the look of a brick and mortar casino game – symbols on the reels include A to J playing cards values, a tusk, a jade pendant and the mighty tiger. The most lucrative symbol is the Sumatran Storm logo which awards 60, 150 or 1,000 coins if you land 3, 4 or 5 in combination. The golden tiger is the wild – it lands on the middle 3 reels only and replaces everything with the exception of the scatter and bonus symbols. 3, 4 or 5 scatters anywhere on the reels awards 2, 10 or 50 times your total stake. The eye of the tiger is the symbol you’ll really want to see though – land 5 of these on successive reels and you’ll trigger the Free Spins Bonus feature and be awarded 5 free spins. If there’s more than 1 symbol on a reel, it’s possible to create multiple winning combinations. 5 free spins are awarded for each combination, meaning it’s possible to trigger up to 60 free spins from a single spin. You can trigger even more free spins here too with a maximum of 150 theoretically possible. If you’ve played Siberian Storm, you’ll have a good idea of what to expect here. The imagery and features are pretty basic but the action is fast paced and pretty volatile. If that sounds like an enticing recipe, then you’ll want to make a trip to the jungle in Sumatran Storm.